Lack of weapons? Cool idea. Don't get me wrong, I've read your socio-political piece, and I don't care about that. I'm not American, never been to the US, and US's all consuming issues with firearms are completely alien to me, and therefore utterly meaningless. Sorry. Where I live, firearm control laws are incredibly strict - you usually have to be either with the military or law enforcement in order to obtain one. Very few people own them, a even a lot of police officers don't carry them. Sure, there are unfortunate firearm related incidents from time to time, but it is far from being a pressing issue like it is in the US. Overall, firearms are something most people here just don't care about and don't pay any attention to. Myself included. That said, I think turning the tables is an interesting idea. Rather than the player cutting down their hapless foes like weeds, it's the player who is largely defenseless, and will be short lived if they get careless. Thrown into untamed wilderness with nothing more than a tiny knife at your disposal? I like it. Forces you to get creative, clever, strategic, badass. Gives me extra motivation to go vegan in the game, too, like I am IRL. It's a refreshing change of pace, departing from the typical game play formula for something different. TL;DR - I think the political agenda stuff is all nonsense, but I nonetheless love the emphasis on pure "survival". I don't think it was anti-gun agenda at all, looking at their other games. Well, I've not played any of their other titles so far, so I'm only going by what I've seen personally. My assessment may not be at all accurate. Sometimes it isn't about bad things. Don't get me wrong, I've read your socio-political piece, and I don't care about that. I'm not American, never been to the US, and US's all consuming issues with firearms are completely alien to me, and therefore utterly meaningless. Sorry.. It doesn't really matter because if fact a looooot of country fit with the declaration of the author, so it's a very commonnly shared point of view. USA are, in fact, an exception in the world. In the world the vast majority of country have forbiden firearm. So for a vast majority of people the USA problem with this is nothing but a joke ^^ A verrrrry vast majority of people in the world know the fact that firearm in civilian hand don't make magic thing, even in hands of the most pacific ones (anger is everywhere, error is human) and that those who can have it need, at least, a good reason to (hunters for example) and a very strong formation. It's not a real "debate" in these country (which are the vast majority of the world), it's an history book fact... a reality as obvious as the color of the sky. 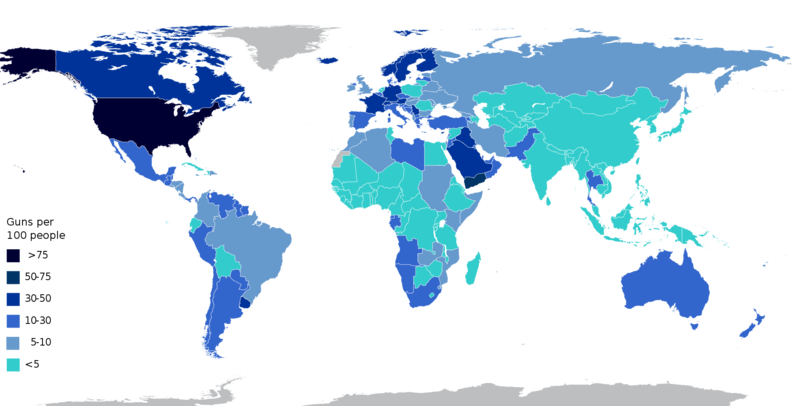 So if you trace the map of hand-gun and assault weapon, the situation is far more contrasted, with north americans almost alone with their specific firearm politics, which is considered as a rude and simplistic cow boy thing everywhere else ^^. I desagree too on the fact that this is meaningless in term of gameplay or on the fact that other type of gameplay could be better. Avoiding firearm force the player, even the more pacific ones, to avoid slacker solutions (shoot, kill and loot) and forces the player to understand behaviour and dangerosity of fauna and to pick attention to the lore, the analysis tools and the description of fauna and flaura etc... So it is a very wise choice of gameplay to avoid firearm in this game. In my opinion. Keep in mind that human (even inteligent and pacific one), by nature, use weapon very commonly when you put one in their hand. Killing the ennemy is always the more "natural" and "easy" path. Increasing difficulty to force player to reconsider its approach is an idea, but in reality it will lead to a vast majority of player entering into an arms race. Which lead to no learning at all on these point. At least their decision to avoid firearm force certains types of player to consider the fact that they play fine in a way that they would never have played if firearm was implemented. No guns sure, but we certainly have weapons. I mean, I'd hate to see the amount of fish I've accidentally* turned into roadkill with the seamoth... whoops. *The Biters and Bleeders might have been intentional. (from my comment) What country do you live in? I'm from America. It doesn't really matter, because, in fact, a lot of countries fit with the declaration of the author, so it's a very commonly shared point of view. The USA is, in fact, an exception in the world. In the world, the vast majority of countries have forbidden firearms. So for a vast majority of people think the USA problem with this is nothing but a joke. A very vast majority of people in the world know the fact that firearm in civilian hand doesn't mean anything, even in hands of the most passive ones (anger is everywhere, error is human) and that those who can have it need, at least, a good reason to (hunters for example) and a very strong formation. It's not a real "debate" in this country (which are the vast majority of the world), it's a history book fact... a reality as obvious as the color of the sky. So if you trace the map of hand-gun and assault weapon, the situation is far more contrasted, with North Americans almost alone with their specific firearm politics, which is considered as a rude and simplistic cowboy thing everywhere else. I disagree too on the fact that this is meaningless in term of gameplay or on the fact that other type of gameplay could be better. Avoiding firearm force the player, even the more passive ones, to avoid slacker solutions (shoot, kill and loot) and forces the player to understand behavior and generosity of fauna and to pick attention to the lore, the analysis tools and the description of fauna and flora etc... So it is a very wise choice of gameplay to avoid firearm in this game. In my opinion. Keep in mind that human (even intelligent and Pacific one), by nature, use a weapon very commonly when you put one in their hand. Killing the enemy is always the more "natural" and "easy" path. Increasing difficulty to force the player to reconsider its approach is an idea, but in reality, it will lead to a vast majority of the player entering into an arms race. Which lead to no learning at all on this point. At least their decision to avoid firearm force certain types of player to consider the fact that they play fine in a way that they would never have played if a firearm was implemented.